The 728th march through the Palatine Spaceport on Hegira. To the cheers of workers at the Palatine Space Port, the 728th Cadian Regiment arrived on Hegira yesterday (3 017 735.M41) in a fiery display of space shuttle landings that raised the spirits of all Imperial citizens who saw it. The arrival of Imperial reinforcements to the beleaguered fourth moon of Sculptor II has been long sought by local military authorities, which have indicated that the Planetary Defense Forces will be inadequate to halt the xeno invasion that began two years ago. The recent fall of Veris Island, a potential springboard for an invasion of the moon’s northern continent, appears to have encouraged the ork tribes of the south, which until now had been observed fighting amongst themselves. Imperial authorities report numerous tribes now moving north to rally under the command of the ork leader known as Rumlar, who led the fight that drove the PDF off the strategically important island. Cadians on patrol as they protect Hegira citizens from the xenos hordes. After welcoming ceremonies by Praetor Favious Syagrius, the Imperial head of state on the moon, the Cadians were transported by Chimera and Taurux Prime transports to the Imperial front lines. Details of the regiment’s deployment are, of course, restricted by authorities, but elements of the regiment have been observed in the Iron Spires, Ruination Pass, Port Hinga, and the K’Nash Bunker. TWELTH FOUNDING (665.M41)—A dozen regiments have held the esteemed 728th designation over the millenia. After suffering severe losses during the Galloria Campaign, the 11th incarnation of the 728th Regiment is decommissioned, with the 52 guardsmen granted the extraordinary honor of retirement from active service. 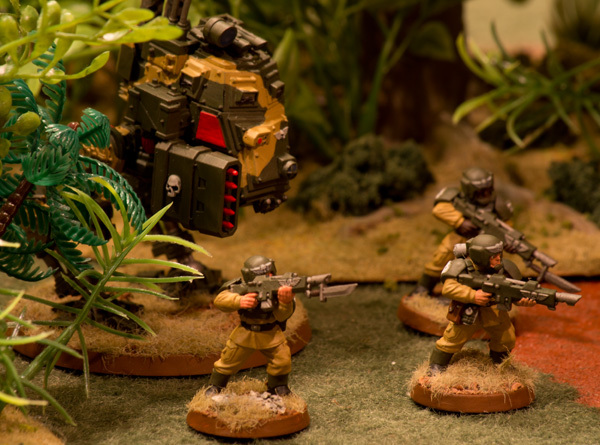 Five years later, the current 728th Regiment is recommissioned in 665.M41 on Cadia in the Segmentum Obscurus. FALL OF CIAPHAS (671.M41)—One of a dozen regiments that fight the invasion of the Imperial world of Ciaphas by the forces of Chaos, the 728th wins renown for its rearguard action while the planet is evacuated. The regiment’s commander is the last Imperial soldier to leave the world prior to it being virus-bombed. Infantry and an Imperial Sentinel patrol the frontier. THE XILIEN EXTERMINATION (677.M41)—Two minor campaigns eventually bring the 728th to the Ultima Segmentum, and the regiment is deployed to exterminate a technologically advanced reptilian race known as the Xiliens, whose home world is deemed dangerously close to a strategic warp route used by the Imperium. 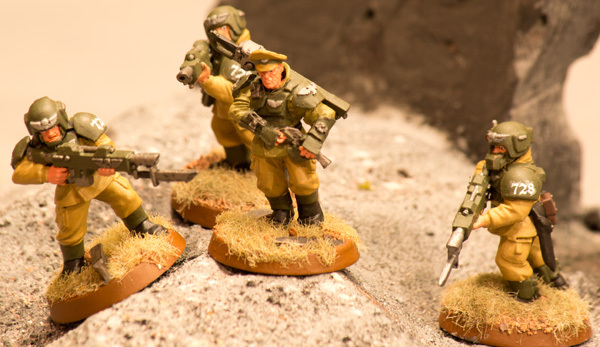 The 728th is one of six Imperial Guard regiments that land on the steamy jungle world and engage in two years of continual and ruthless campaigning. THE ASTRAKAN UPRISING (688.M41)—During the defense of Astrakan’s capital city of Surgut, the 728th face Chaos Space Marines from the Night Lords Traitor Legion, as well as rebel Chaos cultists and renegade PDF. The Chaos-led rebellion is only defeated by the arrival of the 3rd Company of the Ultramarines Space Marine Chapter. RECOVERY OF TITANICUS DIMONI (701.M41)—The Ordo Xeno discover that the orks of Esskay, an ice world ruled by Ork Warboss Baruk Snodgard, have discovered a long-buried Imperator Class Titan and are seeking to convert it into a ork war machine. Imperial authories recognize that this powerful Titan is too great a threat to be controlled by xenos, and an Imperial expedition is mounted by the Adeptus Mechanicus and the Crimson Scions Space Marine Chapter. The 728th deploy to guard the Tech Priest contingent that seeks to recover the Titan. Ultimately, the savagery and numbers of the ork horde proves too great, and to the consternation of the Adeptus Mechanicus, the Crimson Scions use explosive charges to destroy the Titan before withdrawing into orbit. THE MISSING EXODITES (723.M41)—The regiment’s first military campaign within the Corvus Cluster. A splinter group of the Eldar, known as Exodites, have emigrated from their Craftworld to establish several small colonies on a world circling the red dwarf Valuyki. The Imperial Navy bombards the xeno communities from orbit, and the 728th makes an uncontested landing outside the largest colony. No resistance meets the regiment’s advance, and although scanners had identified a significant xeno population just prior to the naval attack, the regiment finds the colonies deserted. Not a single xeno body is found. WAAAGH! GORGRUK (732.M41)—During the defense of Hive Lyantor, the 728th launches a counterattack that shatters the ork horde of Warbass Gorgruk and crushes the ork leader under a Lemon Russ tank track. The victory costs the regiment half its armored vehicles. COMMAND STRUCTURE—Commander of the 728th is Colonel Augustus Klein, a 52-year veteran who joined the regiment in 695.M41 as a bugler. An up-and-coming officer is Captain Stevrous Stark, commander of the regiment’s 2nd Company. Colonel August Klein—Klein was found as a child amongst the ruins of Rigus IV, where the 728th had landed in response to a distress call that the world was under attack by Dark Eldar Raiders. The Eldar are gone by the time Imperial troops arrive, and Klein was the only known survivor of the world’s population of 2 million. Enlisting in the regiment as a bugler, Klein spent his early years as far from the battlefield as officers could manage, but everyone in an Imperial Guard regiment fights, and so Klein soon was on the front lines—and proved himself highly proficient as a soldier. With an excellent grasp of tactics, he soon rose through the ranks, taking over the regiment in 724.M41. Captain Stevrous Stark, commander of the Cadian force that defeated the Tau on Dar Sai. Stevrous Stark—The commander of 2nd Company recently won acclaim when he was dispatched from Hegira to Dar Sai to drive Tau forces off the moon. On 6 023 735.M41, his company severely mauled a xeno force of equal size in the Hanui Valley, a lightly populated agricultural region of the moon. ORGANIZATION—The 728th consists of 8,000 guardsmen deployed in 24 companies. The regiment also contains two tank companies (armored fists) that are understrength after losses sustained during the defense of Hive Lyantor. The regiment also possesses an understrength Valkyrie squadron used for scouting and behind-the-line raids. Where did you get stark’s model? I’ve never seen a revolver sprue. It’s really cool! It’s part of the “Cadian Infantry Squad Upgrade Pack” at Forge World. 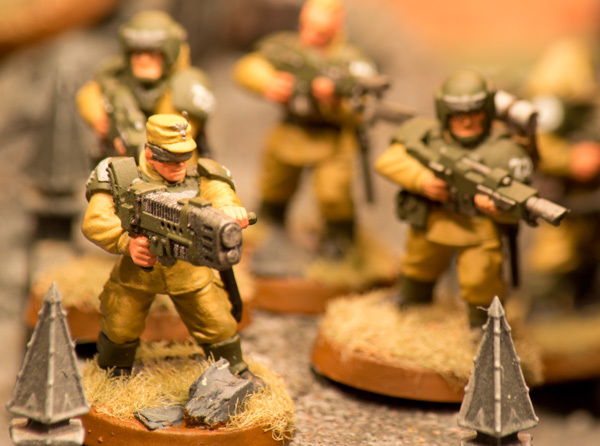 I buy the packs because I want my Cadians to have backpacks–and I try to stick to GW products, partly because I get a kick out of the creativity required when you put a limit on your options. The pack is an insanely priced 23 English pounds for 10 backpacks. But you get the officer’s torso and head and other assorted tiny bitz so that obviously makes it worth the price, right? Nice! I command the 727 City Wolves Cadian Regiment. Send a photo of your regiment. Military HQ is interested. 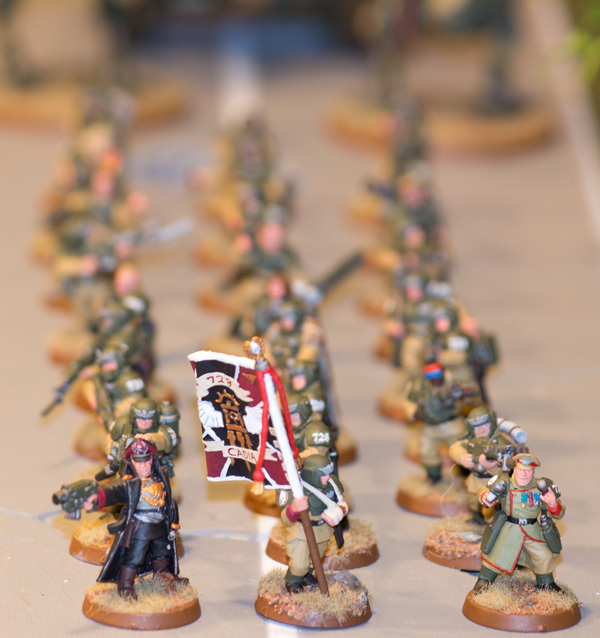 How did you come up with “city wolves” as a name for a Cadian Regiment? What’s their history?